Our newly formed CSR committee organised a fantastic mix of events to raise valuable funds and make sure we increased awareness of mental health along the way. Not only did everyone have a lot of fun but together we raised an impressive £250 which, generously matched by CEO Howard Bentwood, brought the total to £500. 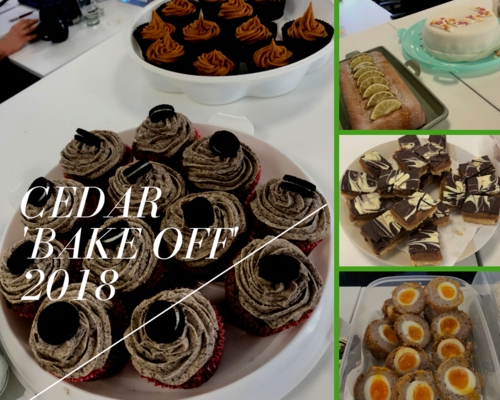 Throughout the week we ran our very own ‘Bake Off” – the only difference being that everyone had to make a donation before they were allowed to judge! – and our bakers certainly pulled out all the stops. A delicious variety of cakes appeared, including carrot cake, millionaire shortbread and salted caramel cupcakes, while for those without a sweet tooth (yes, there are some!) there was even a savoury offering: home-made scotch eggs from Director Matt Langley. The week was rounded off with a hugely entertaining Mastermind-style quiz hosted by our very own Magnus Magnusson (or should that be John Humphreys? ), Director Graham Thornton – who was commended for his sterling work in preventing things from becoming too raucous! Teams of six had to name their team based on an acronym of M.I.N.D before, fuelled by pizzas and drinks courtesy of Cedar, and with fingers on (incredibly noisy) buzzers, they went head to head on specialist subjects including sport, geography, celebrity trivia, film and, to mark the Royal Wedding, a special Royals’ round. Between each round there was also a bonus question relating to mental health. These produced some hard-hitting statistics which definitely gave pause for thought and reminded us all why Mind’s work is so important. The week couldn’t have been such a success without the hard work of the team of organisers and the enthusiasm and contribution of every single ‘Cedarite’ so a huge thank you to everyone for their generosity and input. We’ll be organising more events throughout the year, so watch this space. And don’t forget Graham’s already in training for the Surrey 100 bike ride which he’ll be tackling in aid of Mind, so please do sign up to sponsor him.